This is a pdf form that you can fill out on your computer, save it and send it in to the club as an attachment to a email. The form can also be printed and filled out by hand, and mailed in via US postal service. 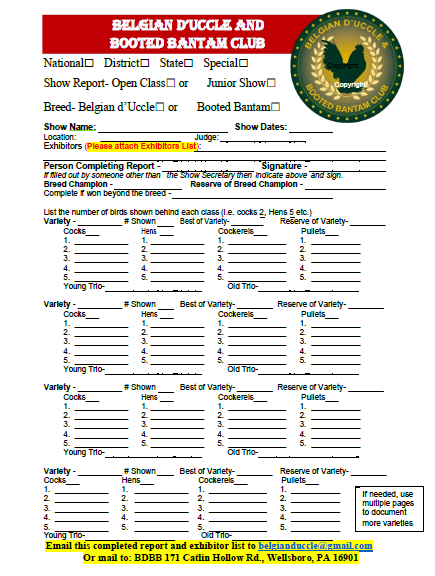 ANY BDBB club Member in good standing or a Show official can fill out and submit a Meet Report. 1. An EXHIBITORS LIST MUST ACCOMPANY THE SHOW REPORT from the show and mark all those persons showing d'Uccle and Booted Bantams. 2. Junior Show Exhibitors may not compete with Open Exhibitors to qualify for Junior points/awards. If they are in the Open Show (combined) they will only be counted as Open. 3. 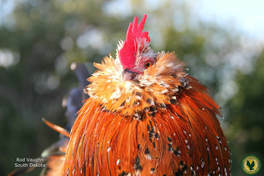 All exhibitors of d'Uccles &/or Booted Bantams are to be listed regardless of membership status.